Tirumala Temple is one of the 108 Vaishnavite Divya Desas located in Tirumala Hill, Tirupati, Chittor District, Andhrapradesh, India. In the Garbha griha of Tirumala Temple, the main deity is Lord Sri Venkateswara Swamy.The main deity is known as Dhruva Bera. Apart from the Main temple there are several temples and places of interest to visit in and around Tirumala. Sri Varahaswami Temple in Tirumala is located to the north of the Sri Venkateswara Temple, on the banks of Swami Pushkarini. Sri Bedi Anjaneya Swami Temple: Sri Bedi Anjaneyaswami Temple is located on Sannidhi Street, opposite the main temple. (In the Vaishnavite tradition, it is customary to have either Garuda or Anjaneya opposite the main temple.) The idol of Sri Anjaneya is shown with its hands folded in supplication (the Anjali pose). 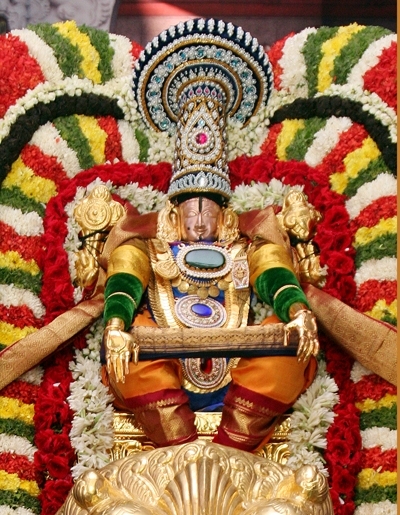 Sri Anjenaya is a devotee of Sri Rama, just as Garuda is of Sri Maha Vishnu. Abhishekam is performed every Sunday and special offerings are made on Hanuman Jayanti. Sri Anjaneya Swamy Temple: Sri Anjaneyaswami Temple is located opposite the Sri Varahaswami temple on the north-eastern banks of the Swami Pushkarini. It was constructed during the Mahant's period . The idol's hands are joined in supplication (in the Anjali pose). Swami Pushkarini: Swami Pushkarini is adjacent to the Srivari Temple. It is believed that bathing in Srivari Pushkarini remove all sins. Srivari Float Festival(Teppotsavam) in the month of March/April and Chakrasnanam during Brahmotsavams takes place in the Swami Pushkarini. Theerthams(waterfalls) in Tirumala: There are several Theerthams(waterfalls) located in and around Tirumala. 1)Akasa Ganga is about 3kms to the north of the temple, 2)Papavinasanam: This is about 5kms to the north of the Srivari Temple, 3)Vaikunta Tirtham: It is at a distance of 3kms north east of the temple, 4)Tumburu Tirtham: It is about 16kms north of the temple, 5)Kumaradhara Theertham, 6)Ramakrisha Thirtham, 7)Chakra Theertham, 8)Japali Theertham, 9)Sitamma Theertham, 10)Sesha Theertham. Geological Arch(Shila Thoranam): This is a rare geological formation in the form of an Arch near Chakra Theertham situated at 1km, north of the temple.Geologists have identified the rocks on the hill as pre-Cambrian, and this arch formation suggests an antiquity of several million years to the Tirumala hill. It is said that there are only two other natural rock arches of such great antiquity in the world. TTD Gardens: TTD maintains beautiful ornamental gardens with rare species of plants and trees which are located around the temple. Asthana Mandapam(Sadas Hall): This is the venue for the devotional programmes like religious discourses, music concerts, harikathas and bhajans conduted under the auspices of Hindu Dharma Prachara Parishad. 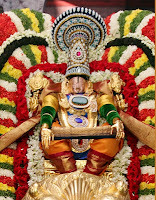 Sri Venkateswara Dhyana Jnana Mandiram(S.V. Museum): This building an architectural beauty, houses a museum, mediation centre and photo gallery.The Sri Venkateswara Museum was established in 1980. Stone and wooden carvings, articles used for puja, and traditional art and architecture are displayed here.